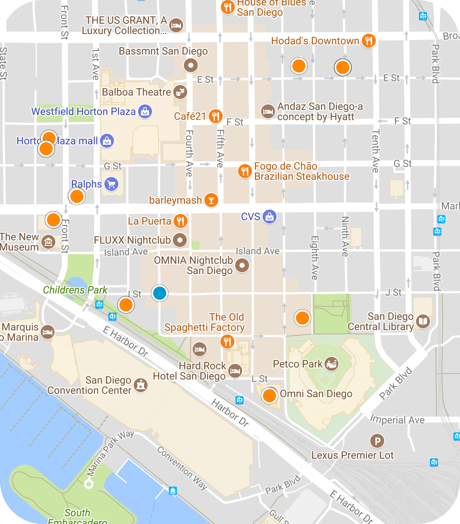 The Historic Gaslamp Quarter has become one of San Diego’s most popular neighborhoods, featuring an attractive blend of old and new buildings buzzing with activity. This district’s unique architecture stands as a testament to its 30-year heyday, between 1880 and 1910. This 16.5-block neighborhood is recognized on the National Register of Historic Places, and its 94 historically or architecturally significant structures now house more than 70 restaurants and nightclubs, movie theaters, shops, offices, galleries and lofts. The Asian Pacific Thematic District also has a significant history in the Gaslamp, and several Asian-style buildings still stand. Currently, 95,500 square feet of retail, 334 hotel rooms, and 364 residential units are planned for development over the next three years. Annual events such as Street Scene, the Mardi Gras Celebration, ShamRock, Taste of Gaslamp, and Cinco in the Gaslamp are held in this district, to the delight of San Diego area residents and visitors. Aside from the Padres at Petco, Gaslamp nightlife is where you will find the pulse of Downtown entertainment.